You may recall the enthusiasm this here blog expressed for Kelvox1’s Grazed Red when it emerged as a free download release last year. (You may also remember this here blog’s embarrassing inability to spell the band’s name correctly but we’ll just gloss over that.) That download disappeared from the Internet pretty quickly and a hard-copy release seemed to be on the cards. And just recently, Grazed Red re-emerged as an LP on New Jersey’s Aagoo Records. Listening to this album as a free download, it was hard not to to be impressed by its sophistication – electronically-enhanced avant rock on a truly epic scale. Hearing Grazed Red again as a fancy-pants vinyl LP puts it into a different context; throwing into sharp relief the fact that it is, in many ways, a very primitive recording. Lo-fi murk abounds. The vocals, in particular, sound choked by the spores of practice-room mould and mildew. It’s the tension between Kelvox1’s clear artistic ambitions and the lo-fi insouciance of the way Grazed Red is delivered that makes it such a compelling, multi-dimensional listen. 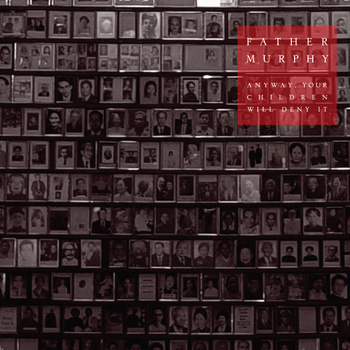 This same tension is very much present on the latest album from Brooklyn’s Father Murphy, another recent Aagoo release (and while we’re at it, on the phenomenal new Woebot album too). Like the Kelvox1 album, Anyway, Your Children Will Deny It is a darkly enigmatic piece of work. There’s a slightly gothy, theatrical edge to this one, so comparisons with Swans, Virgin Prunes and Einsturzende Neubauten make sense. However, this surprisingly normal-looking three-piece does a pretty good job of not sounding quite like anyone else. Even better, it’s occasionally hard to tell what instruments or electronics are being used to produce the sounds on Anyway… (although online evidence suggests a fairly simple guitar/keyboards/drums line-up). Even, even betterer, this album is among the select breed of long-players that are actually short enough to play at 45RPM (Meat Puppets II and Sylvain Chauveau’s Singular Forms spring to mind as other great examples). The point is: these guys have artistic ambition to spare but they also know how to be concise. Aagoo is a new name to the Bubblegum Cage III. But on this evidence, the label is doing extremely good work. Head over to its Web store immediately and buy these albums! Entry filed under: avant rock, live, MP3s, post-rock, reviews, UK post-rock. Tags: avant rock, live, MP3s, post-rock, reviews, UK post-rock.